← Walking free or striding to jail? Dionysius, the city’s first bishop, is said to have been deeply affected by witnessing the sun being blackened while on a trip to Egypt at around the time of Christ’s crucifixion. It was fitting, therefore, that on the boulevard bearing his name, there should be a dark spot that even the joy of spring could not brighten. At number 33, passers-by stood for a moment or cast furtive glances as they strode on. For this was the 200-square meter neoclassical home of former Defense Minister Akis Tsochatzopoulos and his wife Viki Stamati. It attracted such attention because it was one of the most expensive properties in Athens and there was intense speculation about how “Akis,” as he was known to most Greeks – the civil engineer who had met future Prime Minister Andreas Papandreou in 1968 as an exiled student in Germany – had managed to acquire such wealth to purchase this property. In February 2011, more than 1,000 protesters had gathered in the rain outside the luxury apartment. “Bring back our money,” they chanted. Since Tsochatzopoulos left active politics and married his second wife, Stamati, in a no-expenses-spared ceremony in Paris in 2004, rumors and reports about the former interior, defense, transport, public order, development, labor and public works minister’s practices have abounded. His alleged exploits became part of folklore and there was a resignation among voters that Tsochatzopoulos was one of the untouchables that would get away with abusing their power for personal profit. His elegant property became an unintended monument to an era of post-dictatorship Greek politics when theft, be it by taxpayers or politicians, became an acceptable by-product of social peace and prosperity. This illness went right to the top. It is worth remembering that Tsochatzopoulos served as caretaker prime minister in 1995 when Papandreou fell ill and agreed on Greece’s behalf at the Madrid European Council that year to the decisions to include Eastern and Central European countries in the EU and to name the single currency the euro. A year later, he came within six votes of becoming the new Greek prime minister instead of Costas Simitis. On Monday, though, Tsochatzopoulos was found guilty of failing to declare his assets over the last few years. Among them was the central Athens property. A judge handed the ex-minister an eight-year jail sentence and ordered that the home be seized. The ruling carried considerable symbolic, as well as practical, weight. It was the first indication that the state is prepared to wrestle back ownership of what has been taken from it illegally. If the Supreme Court rubber-stamps the judge’s verdict, the ex-minister’s home will become taxpayers’ property. One siezure does not make a spring but a taboo has been broken. Thessaloniki Mayor Yiannis Boutaris also said that the municipality would seek to recover damages from his predecessor Vassilis Papageorgopoulos after he was found guilty last week of embezzling funds. Tsochatzopoulos is yet to stand trial for the alleged embezzlement of taxpayers’ money when agreeing defense procurements in the late 1990s and early part of the last decade. Meanwhile, three other former ministers – Yiannos Papantoniou, Petros Doukas and Giorgos Voulgarakis – were charged on Wednesday with failing to correctly fill in their derivation of wealth (pothen esches) forms. 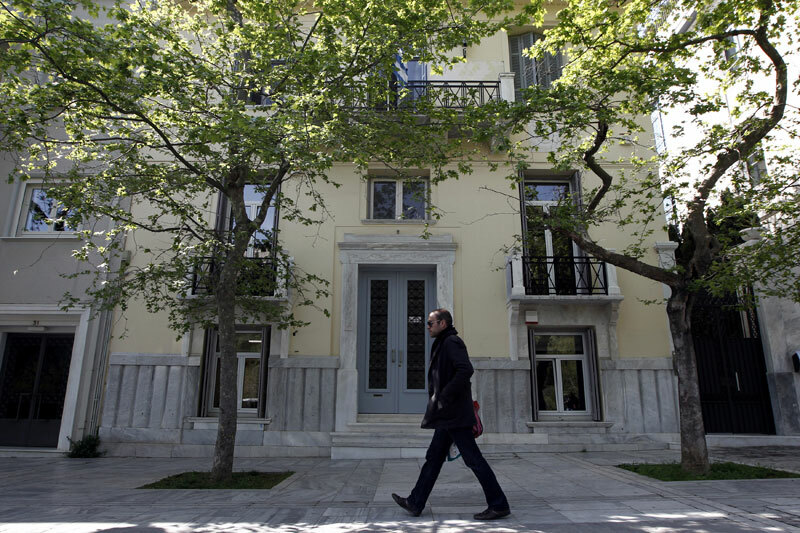 Only a few years ago, Tsochatzopoulos’s sentencing and authorities’ pursuit of other political figures would have been momentous news in Greece, but amid the pain of recession and controversy of austerity, reaction has been relatively muted. Perhaps after years of inaction, some Greeks have become immune, unable to believe that the once-mighty are getting their deserved comeuppance. One of the recurring comments from beleaguered citizens since the start of the crisis has been that nobody has been held responsible for Greece’s plight. “Nobody has gone to jail,” you would hear again and again over the past three years. Well, now someone has gone to jail and there can be hope that accountability will be restored. There is still much work for Greece’s investigative authorities and its judicial system to do. Perhaps, though, for the first time there is genuine momentum for Greece’s public life to be cleaned up. Where there was once a climate of tolerance, there is now a desire for justice. For there to be tangible redress, judicial officials will need support, guidance and protection. They might have to call upon all the powers of their patron saint: Dionysius the Areopagite. This entry was posted in Greece, Greek politics and tagged Akis Tsochatzopoulos, Andreas Papandreou, Corruption, Greece, Greek crisis, Greek politics, New Democracy, PASOK, Vassilis Papageorgopoulos. Bookmark the permalink. And yes, it is a momentous step indeed! Agreed. Nice to have you back, Anton. Thank you, Nick. Alas from the other side of Europe. That will be another couple of weeks and it makes it very difficult to keep deep enough informed about what is really happening. You are a cornerstone that helps me in that! Yes, it is surprising that the Greek media are not as much ‘on the attack’ against corruptive practices of the establishment as the media of other countries often are. And, I hasten to add, the media of other countries are not so much ‘on the attack’ because of their noble intentions but, more likely, because such ‘attacks’ make for good circulation (my personal opinion). Why do the Greek media forego such circulation potential (and profit potential, too!)? This remarkable article may provide some answers. The evidence is that the entire Greek state is shifting toward a fascist controlling mentality. Why do the Greek media forego such circulation potential (and profit potential, too!)? If you’d heard stories of vengeance against innocent ‘whistle-blowers’ in Greece, such as I’ve been told recently Klaus, you would know the answer. FEAR for themselves and for their families. Sorry, but I see no evidence of a clean-up of political life. Rather, I see a token sacrificial lamb, who is currently out of political favour. Did Akis steal all this money on his own, without accompllices in the political and bureaucratic system and undetected by authorities? if he did, then the man is so brilliant that he deserves to be left alone. No, the answer is more mundane: this corruption was so normal (for both Pasok and ND), involved everyone around him, and they are just as culpable — regardless of whether they received moneys or not. The same with the other sacrifical lambs, recently indicted. This is not about a few rotten apples in a barrel: it should be about the rotten barrel. Of course, the current government (or at least its political supporters) are the rotten barrel: how could they deal with the problem of themselves? The idea is so preposterous, I really don’t see why anyone takes it seriously. For this reason, your commenter Anton is not only right, but his comment is the only recourse. Greece is reliant on its journalists and press for reform: given the clear attempts to stifle press freedom that the current regime is engaged in, I am not confident that the Greek press will serve Greece well. I couldn’t agree more. And that disgusting Mandelbrot is the epitome (along with Blair) of British corruption. The problem for Greece, though, is that what are exceptions in Britain are the standard for Greek politicians. It is alarming that while Samaras appears to outsiders as a thoroughly westernised, 100% american-educated, EU politician, he is leading his party away from both the norms of decency in western society today, and from the firm democratic principles of its founder Karamanlis. Instead of expressing concern over the intimidation and death threats made to a journalist and his family in the course of his work, instead of rejecting illegal behaviour on principle, ND’s spokesman (Voridis) dismisses the matter as trivial and of interest only to the court of first instance. Worse, his display of contempt and dripping sarcasm is shocking to decent greeks and outsiders alike. Politically this was a stupid and tin-eared response: ND’s spokesman shows that ND has no concern for a free press, no concern for death threats and intimidation; no concern that these threats originate from an Aegean Oil telephone number [the company poised to buy OPAP]; in short, that ND has no intention of investigating this matter. Not exactly the response one would expect in an advanced democracy. The coalition government was voted in by centrist voters, but ND today is moving far to the right, in its over-use of coercion and in its playing up to the most thuggish elements of greek society (Golden Dawn) and their agendas. The call for the armed forces to be cleansed of any but greek blood will pose problems at Evelpidon cadet school, where greeks of African, Asian and other mixed backgrounds and with foreign names graduate yearly. The academy has much higher entrance standards than the greek universities by the way, so these are highly intelligent young men and women. They passed the ‘greek’ test as far as the army is concerned but many will not pass Golden Dawn’s sight test (women, blacks, asian…). How do you define greek blood? Or greek-ness? Will families like Averoff, Syngrou, Deltas, Matsas, Fix be forced to leave? Will we dismantle Zappieon as a national disgrace? Tear down the Schliemann house and the works of Tsiller, including Maximou? Ban books by Runciman etc.? Close Arsakieon, Collegio, Pierce, the American Farm School because of their foreign origin? Do we tell Qatar to go to hell? Undoubtedly we shall have to leave the EU to achieve blood-cleansing and to stop the right of 27 foreign nationals to live and work here. Our country will become too dangerous for tourism. Last September I was stopped in the streets by Golden Dawn behind Maximou as I returned home from lunch in Kolonaki. When I refused to show them my taftotita, my bag was snatched from me and in the tussle I was thrown to the ground and kept down by their boots. I confess here to the blood crime of having an English mother (who came here in 1948 and fell fanatically in love with Greece); I also have 2 passports. Unfortunately my English passport was in that bag and was found. After been told to get out of Greece, that I had no right here, that I was stealing bread from the mouths of the greeks, I was left to hobble home keeping the torn straps of a ripped and muddy dress together. All I could think of was that I got off lightly…. My point is that ND, instead of drawing a strong line for democratic values a la Karamanlis, has drifted instead into supporting barbarity. If Samaras is as westernised as he likes to project, then clearly he cannot control his party and should step down from leading it. If these are Samaras’ choices (which I suspect they are), then they are far too dangerous in my view to earn my support. If Samaras is using the police / Golden Dawn to suppress dissent on the one hand and on the other using the parliament to dismiss legitimate questions of legality, in order to cover up abuses and crimes at a high level, than his party deserves to be brought down. The fact that these questions must be asked would have Penelope Delta turning in her grave! A ‘joke’ circulating in Athens is that the country is being run these days from Korydalos prison. Of course Tzochadzopoulos is a scapegoat. Criminal yes, but the burnt offering. Among infamous maimoudes, where, for example, is Laliotis? Defense offers big-time one-off payments, but Public Works – especially over so many years – is just as lucrative, if not more. I am shocked to hear of your treatment by the criminals of XA. Please report this incident to the Greek police, the European Commission and to the British Consulate, as it concerns the rights of all European Citizens in Greece. Moreover, it also concerns the ability of the Greek state to enforce the rule of law. You are quite right that ND is not interested in the rule of law; basically they are the same type of criminal opportunists as Laliotis and others of the past. I had the extreme displeasure of seeing this crook Voridis on the incompetent BBC debate (held in the Onassis Foundation) about immigration recently. His opening line was nothing other than a standard piece of crooked thinking (see Thouless’s book, Straight and Crooked Thinking) where he inverted the question of the debate. He said, if we ask the opposite question “should we open the door to immigration?”, then logically if you answer No to that, then you should support the opposite question which is the motion debate. This is not logic: it is someone using his education to trick people, and trick them into his ugly, nationalistic and right wing view of what Greece (and each EU country) should be like. Everything presented in that debate was either a lie or a misleading half-truth — and the incompetent BBC even allowed Voridis to interrupt aggressively his opponents. Thank you Xenos for your concern. I did report it, and it was picked up and covered by several newspapers here and in the UK, but I instinctively avoided going to the nearby police station following the incident because I had the jumbled impression – in the moment – that they were also policemen. An impression that could easily be wrong. Oh, in that case I guess I know who you are! The press reports I am thinking of made quite an impact, and damaged XA’s credibility quite a bit, I think. I had a near encounter in Ermou the other day. I saw two large thugs in black leather jackets standing at the side of the street, legs apart as if they were soldiers standing guard. I looked again, just to check what I suspected, and one of them looked me over very carefully and suspiciously. Usually, Greeks think I am pale-skinned Greek with nice coloured hair; and I get away with barking basic insults in an authentic Athens accent. It is about time that the Greek Ministry of Truth (sorry, of protection of the citizens) actually did something to protect citizens from the criminals involved with XA. The management of policing in Greece has been a third world shambles for decades, with blatant corruption, refusal to carry out their duties, ignorance of the law and violent assaults on Greeks as well as foreigners. No Greek can be proud of this country for as long as Greece behaves more like Bangladesh or somewhere, and has no place in the European Union when it cannot guarantee the rule of law — even concerning its own police force. I watched that debate twice: a typical BBC unintelligent bit of theatre, as you say deceitful. I could barely watch it once! I think my tv screen would not have survived intact with a second showing. The Ministry does almost nothing because it suits their purpose that we feel some fear, or perhaps, as the silver-tongued Voridis might put it, “respect”. My feeling is that the present government has become so isolated in its self-imposed bubble – along with the crooked magnates it serves – that it has completely lost touch with reality on the ground and is now, perversely, over-estimating the appetite for revolution in the country. Greeks want justice, transparency, a clean slate, political accountability and most important, a plan for the real economy. They don’t want ‘bloody revolution’, or civil war, they want real change and a road plan. The old corrupt parties managed to keep the lid on political-oligarchic corruption for 3 years. The battle over the Lagarde list, Boutaris’ investigation into the previous administration in Thessaloniki, the embezzled Proton shareholders forcing the Lavrentiades case into court – events that could not be stalled forever – have produced a series of cracks in the facade, cracks that are gaining their own momentum as the apparent tip of an iceberg. Add to this the UNFOLLOW/ Aegean Oil case and yesterday’s “breaking news” on Kyriakides, and it must seem to the government now that ‘events’ are moving beyond damage control. The Kyriakides / Skoura abscondments are utterly incredible stories….However, more shocking is that these took place on 14 Dec. 2012 and are only revealed in the greek news 10 March 2013, when, among other things, the trail has become ice cold. It is impossible to believe that officials involved with the Proton Bank case were unaware of this event. At the same time it is clear that a news lockdown has been put in place. But to what end? – since it would have served the government to condemn this and move immediately to extradition. Not only the public has been kept in the dark but obviously, too, the embezzled Proton Bank shareholders – who brought the case to court against fierce resistance. If the ND/PASOK majority of the coalition government is running scared this could be very dangerous for Greece.